Ottawa chef Marc Lepine has reclaimed his title at the Canadian Culinary Championships, beating 10 other chefs to take the gold medal at the competition in Kelowna, B.C., early Sunday morning. #CCC2016 CHAMPION is Chef @MarcLepine! #GOLD Medal dish paired with @LeClosJordanne 2012 Vineyard Chardonnay, Twenty Mile Bench! CONGRATS! Lepine, who is the chef at Atelier on Rochester Street, last won the competition in 2012. 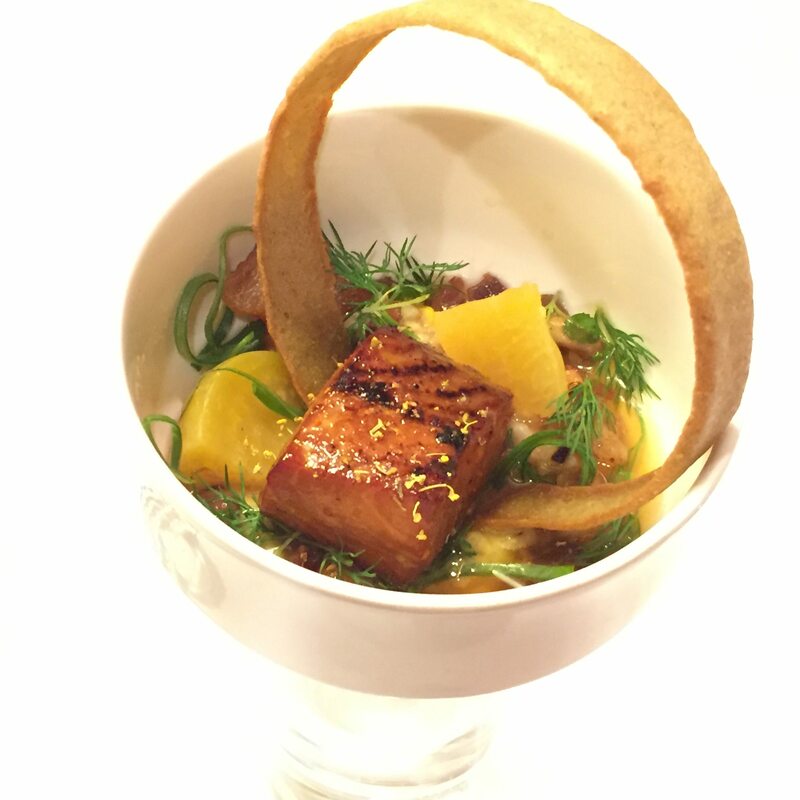 Lepine won the prestigious competition this year with a dish of steelhead trout encircled by a toasted tuile studded with fennel seed. His entry was paired with Les Clos Jordanne Vineyard 2012 Chardonnay Twenty Mile Bench from the Niagara Peninsula. Marc Lepine captured the gold with this dish. Photo by Anne DesBrisay, Ottawa Magazine. Silver went to chef Mathew Batey from the Nash Restaurant & Off Cut Bar in Calgary, who prepared smoked sablefish, Pacific octopus compression, northern divine caviar, Yukon Gold potato, sabayon paired with the Road 13, 2011 Sparkling Chenin Blanc from Oliver, BC. Chef Alex Chen from Boulevard Kitchen & Oyster Bar, Vancouver, won bronze with truffle-scented chicken, celeriac fondant, foie gras-stuffed celery, “Umami” consommé, paired with the Foxtrot Vineyards, 2009 Pinot Noir from Naramata, B.C. DesBrisay’s judging colleague, James Chatto, noted that Lepine won all three components of the competition. Lepine opened Atelier in 2008 after working in various cities in Italy, France, the United States, and at home in Canada. Lepine, who is also a graduate of Algonquin College’s sommelier program, quickly began to make a name for himself, but it was the 2012 gold medal at the Culinary Championships that really raised his profile on the Canadian food scene. Only a few weeks ago Atelier was the only Ottawa restaurant to be featured in OpenTable’s annual ranking of the top 100 restaurants in the country. DesBrisay will have all the behind-the-scenes info on the big competition, the winners, and the award-winning plates — watch this site on Sunday for details!